THERE HAVE BEEN SOME HONEST BANKERS THROUGHOUT HISTORY, BUT PROBABLY NONE THIS HONEST. 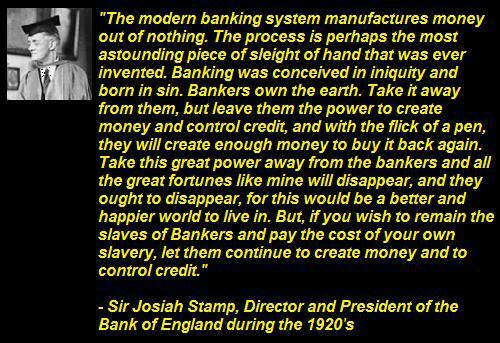 THE ATTRIBUTION TO SIR JOSIAH STAMP IS PROBABLY BOGUS, HOW MUCH DOES THAT DETRACT FROM THE TRUTH IN THE WORDS? THERE IS A TREMENDOUS AMOUNT OF TRUTH IN THE WORDS .. SO WE SHOULDN'T NEED TO RESORT TO MAKING ANYTHING UP. WAS THE FED'S ORIGINAL MISSION A RUSE? OR DID THE FED TAKE 'MISSION CREEP' TO THE ENDS OF THE EARTH? DAVID STOCKMAN* EXAMINES HOW FAR THE FED STRAYED FROM ITS CLAIM OF HONORABLE INTENTIONS AT ITS FOUNDING .. "its real job is to provide back-up liquidity to the banking system at a penalty spread above market determined interest rates and yield curves ... It just so happens that this was the original mission assigned to it by its author, Congressman Carter Glass, in the 1913 Act which created the Fed ... The Fed that Carter Glass envisioned only needed to recognize good collateral when posted by member banks seeking liquidity loans. It did not need to know what “full employment” is in the context of 410 billion potential labor hours or whether there was too much or too little “slack” or whether the bathtub of potential GDP was filled to the brim or not." I can't find the quote sourced to any book or document either. Thanks for keeping us vigilant. How do you accept the alterations? Whenever I see a quote that seems extraordinary, I want to find the primary source and see if the quote that surprises me is accurate. My question was: What is the source for the quote that is in the image? I wasn't commenting on what you wrote below the image, I was trying to find a credible original source for the words in the image itself. When I do a search, all I can find are secondary sources, none of which points me to the primary source. If I could find the primary source, then I could see if the quote is accurate word-for-word. How do I know that this guy said what is in the image if I can't find where it was published for the first time? In other words, when I see a quote like this, I would like to find someone saying, "This quote comes from Sir Josiah's book named XYZ, page #" or "This quote comes from Sir Josiah's speech entitled 'Money' and delivered month, day, year" or "This quote comes from Sir Josiah's letter to John Smith, dated month, day, year"; then I can go read it for myself in the original and in context, where there might be even more gems. I don't say that YOU necessarily have to provide a footnote, but my point is: If the quote is genuine, then SOMEONE SOMEWHERE will provide the source for it. What I would myself do, especially in a display quote, is to track down the source of such a quote FIRST before using it, so that I knew that it was genuine. Then I would be satisfied that I was accurately quoting someone, which is a fundamental condition of good history and good journalism. And that, as a matter of fact, was exactly what I was attempting to do in this case, when I discovered that there does not appear to BE any primary source for the quote. Someone says that John Kennedy said, "Ich bin ein Berliner". How do I know he did? Maybe that's somebody's invention or urban legend. I go back in newspapers and see the story reporting it. I go to biographies and see the date and the place he said it and I verify the quote with them. Or I watch a video in which he's actually saying the words and find out when and where it was made. Then I feel pretty sure that he did say it. I see what you have written now, which I didn't even notice yesterday. All I could see yesterday was that the quote was still there. I guess what I would ask myself is: Am I comfortable with the possibility that someone will lift an image from my blog that contains a quote that I suspect is bogus and continuing to circulate it? Is the credibility of my blog enhanced by presenting bogus or unverifiable quotations in huge displays? Your input can be valuable. We do have an 'agenda' we want to accomplish, but we don't want to mislead anyone. As I did the last time you invited me to e-mail you, I wrote to you and, as before, I have not seen any response. Perhaps my message landed in your spam folder? I checked my own and I do not see any e-mail from you.